Up and coming American player, Austin Krajicek, didn’t mind having an early wake up call on Sunday morning. 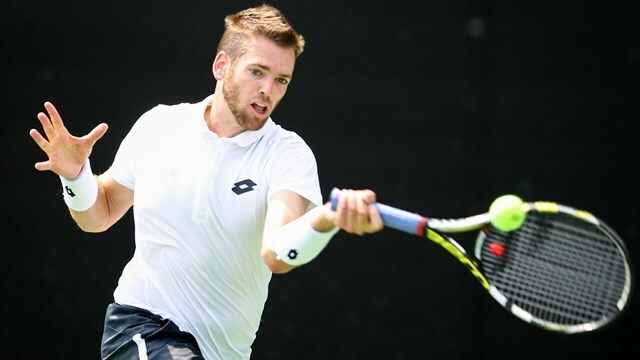 With Atlanta temperatures expected to reach the mid 90s in the afternoon, the Florida native, by way of Texas A&M University, was able to beat the heat as he defeated a former top-50 player in Evgeny Korolev of Kazakhstan, 6-3 6-3, in 75 minutes. “I’m used to the heat from living in Florida, but it’s good to get this one out of the way,” explained Krajicek after the victory. Krajicek, relying on his lefty serve, won 82% of his first serve points in the match and broke Korolev four times in the two sets. In the opening set, the American forced an early break held up to take the set. Korolev broke back early to start the second set and actually held a 3-1 lead, but double faults and an inconsistent forehand would be his downfall late in the set. Krajicek, a distant cousin of former Wimbledon champion, Richard Krajicek, showed a first serve reminiscent of his cousin in closing out the match. “It’s good to be back on American hardcourts,” added the 25-year old who currently sits No. 126 in the ATP World Tour rankings. Krajicek will play his final round of qualifying to earn a spot in the main draw of the BB&T Atlanta Open Monday afternoon. 2015 French Open Boy’s champion, Tommy Paul, of New Jersey wasn’t as fortunate as his compatriot in his second round qualifying match as he fell to Japanese veteran, Yuichi Sugita. Paul and Sugita played numerous long games in the first set, but Sugita, the ATP World Tour No. 152 showed patience and experience in waiting out the long rallies to ultimately take the match 6-3, 6-3. In other second round qualifying matches, Australian Marinko Matosevic defeated former University of Louisville standout Andrew Carter, 6-3, 6-2, and Guido Pella ended the run of Evan Song, 6-2, 7-6(5).